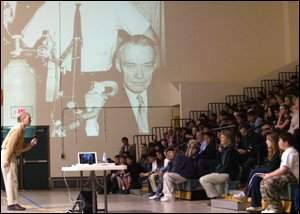 FARMINGTON -- Patrick Reynolds hit a key on a laptop computer and a picture of his grandfather, the tobacco titan R.J. Reynolds, appeared on a projector screen for sixth -through-eighth-grade students at Tibbetts Middle School to see. R.J. Reynolds founded a tobacco company "whose products would go on to kill millions of people and make my family very powerful and very rich," said Patrick Reynolds, now the President of The Foundation for a Smoke-free America. Reynolds, a professional speaker, will make presentations in San Juan County until Friday. Reynolds said he divested his company stock in 1978 and only has "a little family money." When asked how his family felt about the message he delivers, Reynolds smiled. "Some of them don't like it very much," he said. Reynolds began his presentation by telling the students a story of growing up without knowing his father for years and then getting a chance to meet him. "There was my dad, lying on his back, dying," he said. According to a press release, R.J. Reynolds Jr. died of emphysema attributed to his years of smoking. "Cigarettes are addicting, once you start smoking, you cannot stop," said Reynolds, who smoked for 19 years before quitting himself. According to Reynolds, the average smoker uses tobacco for 17 years and 95 of every 100 users who want to quit reuse within a year. That number becomes 85 if a smoking cessation program is used. After delivering the statistics, Reynolds asked the students to raise their hands if they had seen someone their own age smoke cigarettes in the last seven days. More than half of the children raised their hand. "I'm angry, I'm sad and I'm a little bit afraid," Reynolds said of the results of his informal poll. He then encouraged students who had not experimented with tobacco or drugs to not tempt fate. "You will get hooked, mark my words," he said. Throughout the presentation, Reynolds criticized movies and cigarette advertisers for attempting to make smoking look cool and especially for appealing to young people. He noted $15 billion is spent annually to advertise cigarettes and that tobacco companies used to pay stores for counter-top displays that were at eye-level for kids, with the thought that they would frequently get stolen. He added companies were known to reimburse the stores for any losses incurred from theft. "They were keeping it in our kids' face where it was easy to steal," he said, noting the children would get hooked and become purchasers of tobacco. When criticizing advertisers, Reynolds noted the use of attractive young adults and the recent trend of using candy flavors in cigarettes led him to believe the companies were targeting young people. "Come get your red hot tobacco, and get hooked, why don't you," he said. During the presentation, Reynolds repeatedly asked the audience questions and walked into the bleachers to get responses. The most interaction came during the story of Shawn Marsee, a 17-year-old high school athlete who used chewing tobacco with his teammates. After a talk with his mom, he tried to quit, but couldn't, according to Reynolds. Marsee eventually developed a red sore on his tongue, approximately the size of a half-dollar, which was later found to be cancerous. Marsee had a portion of his tongue removed, then a portion of his jaw and later, his neck. Reynolds paused during his story, and looked at a projected photo of Marsee at age 17, before changing to one of him in a hospital gown, wearing his track pins, after surgery. The bottom of his face was seemingly featureless, with no visible jaw line. "Ewwwww," the students responded loudly. Marsee was 19 years old in the photo. Shortly after it was taken, he died of cancer attributed to his practice of dipping tobacco. After telling the Marsee story, Reynolds switched gears and spoke of the future. He told the students they would face many choices and options in their lives on their way to success. "You will need your health in those fantastic, wonderful years that lie ahead," Reynolds said, adding he had faith the students before him would choose not to use tobacco. "Catch my faith and make a wise, intelligent choice," he added. “There was my dad, lying on his back, dying,” said Patrick Reynolds, left, with a photo of his father, R.J. Reynolds Jr., who died of emphysema attributed to years of smoking, projected on the wall of the gymnasium at Tibbetts Middle School on Tuesday afternoon. Patrick, heir to the second-largest tobacco manufacturing company in the United States, is now the President of The Foundation for a Smoke-free America, delivering smoke-free messages to students across the country. Farmington (open to the public). 10:15 a.m. today at Rocinante, 3250 E. 30th St., Farmington. 9:30 a.m. Thursday at Hermosa Middle School, 1500 E. 25th St., Farmington (open to the public). 8:30 a.m., Friday reception at Kirtland Middle School, 538 CR 6100, Kirtland, to meet Reynolds, followed at 9 a.m. by a Town Hall meeting and by a presentation at 9:45 a.m. Copyright © 2005 Farmington Daily Times, a MediaNews Group Newspaper.